In a speech that ran for more than three hours China's President Xi Jinping has said the country has entered a "new era" where it should "take centre stage in the world" [BBC]. In a wide ranging speech, Xi declared victory over "many difficult, long overdue problems" since he took power in 2012 and that China would continue opening its doors to foreign businesses, defend against systemic risks, deepen state-run enterprise reform, strengthen financial sector regulation and better coordinate fiscal and monetary policy. Communist Party Congress conferences take place every five years and are known for their long speeches, declarations of future plans for the country and a platform to set out party priorities. And this party conference was no different. Xi Jinping spoke for 3 hours and 20 minutes, reading from a tome entitled, "Secure a decisive victory in building a moderately prosperous society in all respects and strive for the great success of socialism with Chinese characteristics for a new era"
He spoke of a China dream and a "new era" for China, a phrase repeated no less than 36 times. This was also a platform to declare Xi Jinping's success in tackling corruption and of preparing the way to make China great. Indeed some media commentators were likening many messages coming from the 19th CPC as being very similar to those of Donald Trump. At the Tory party conference Theresa May borrowed from America as she talked about a "British Dream". And Xi appeared also appeared to be using similar language with references to a "Chinese Dream" [Bloomberg]. Unlike Theresa May, the Chinese president managed to get through his 210 minute address without coughing, being accosted by pranksters or having the props disintegrating about him. After all, this was, as Xi declared, a "great modern socialist country" which within the next 30 years would become a "beautiful China". In short Xi seemed to be flying the banner espousing the slogan "Make China Great Again" [Guardian]. But this conference was also seen as one which helps to lay the groundwork to secure power for much longer than the usual 10 year period. After five years defeating political rivals, silencing critics and developing public support built on rejuvenation and fighting graft, Mr Xi is on firm ground to oversee a major reshuffle of China's leadership stacked with those loyal to him [Telegraph]. As recently as April 2016 western commentators were already discussing the so-called 'Cult of Xi' and suggesting he was attempting to establish himself as the the next Mao Zedong [Economist]. State controlled media is often filled with fawning over "Uncle Xi" and his wife, Peng Liyuan, a folk-singer whom flatterers call "Mama Peng". 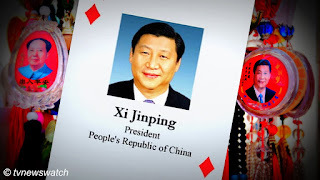 Xi Jinping has accumulated more authority than any of his predecessors since Mao Zedong, the founder of the communist People's Republic of China. Xi has taken personal control of policy making on everything from the economy, national security and foreign affairs to the Internet, the environment and maritime disputes. Now the 62-year-old scion of Chinese Communist Party [CCP] royalty stands at the centre of a personality cult not seen in the People's Republic since the days when frenzied Red Guards cheered Chairman Mao's launch of the Cultural Revolution. Xi repeats the mantra of Mao and rails against "hostile foreign forces" which he and hard liners within the party believe are intent on weakening a resurgent China. "Like Mao, Xi thinks if China succumbs to Western values, these forces will destroy not only China's exceptionalism but also the stability of the Chinese Communist Party," says Roderick MacFarquhar, a Harvard expert on Chinese politics [Time]. Whilst Xi certainly appears to be establishing himself as an autocratic ruler, he does nonetheless appear far more stable than his western counterparts. Xi has sought to portray himself as a strong and stable international statesman. And he is far stronger and clearly more stable than a certain British prime minister who ran her election campaign under that very slogan [Guardian]. Since last year's election of Donald Trump. Xi has also painted China as a far more responsible global power that is committed to tackling shared dangers such as climate change. Indeed, whilst Trump seems intent on turning the clock back half a century and restart the American coal industry, Xi's China it accelerating towards a green future with significant plans to be more reliant on renewable energy [Guardian / CNN / Washington Post]. Xi certainly isn't popular with everyone in his home country. Xi's crackdowns have divided opinion and his firm grip on power brings retorts of 'fascist' from some who are brave enough to express their views. Most of his critics come from the ranks of liberal intellectuals and human rights activists who claim Xi's first term has proved calamitous. Some had hoped he would prove a political reformer. Instead China's authoritarian leader has waged war on dissent with unexpected ferocity, throwing some opponents in jail and forcing others overseas. Some even refer to him as "Xitler" [Guardian]. However, some experts say that many of China's 1.4 billion citizens see Xi Jinping in a far more favourable light. Most western media reports have focused on Xi's plans for the economy, energy and the environment. However, China is also trying to improve its military standing. It is "time to take centre stage" Xi declared. And his vision is one where China can defend itself against military threats. "We must build a powerful and modernised army, navy, air force, rocket force, and strategic support force; develop strong and efficient joint operations commanding institutions for theatre commands; and create a modern combat system with distinctive Chinese characteristics," Xi told the hundreds of CCP members who had gathered in the Great all of the People in Beijing [SCMP]. With many believing Xi is poised to seize "absolute power", it is perhaps no wonder the world is watching China [ABC / Washington Post].